Official artwork of the Poké Ball. The Poké Ball (モンスターボール, Monster Ball) is an item from the Pokémon series. A Poké Ball in Pokémon: Let's Go, Pikachu! and Let's Go, Eevee!, having just caught a wild Pokémon. Poké Balls are the most important items in the core Pokémon games and several spin-offs, where they are used by Pokémon Trainers to catch wild Pokémon, store caught Pokémon and conveniently carry them around. Several different types of Poké Balls exists, which mostly increase the likelihood of catching a wild Pokémon in specific conditions. During battles, Pokémon are sent out by trainers by throwing the Poké Ball into the battlefield, which releases the chosen Pokémon with a burst of light. 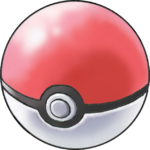 The Poké Ball serves as the series symbol for the Pokémon series. From Brawl onwards, the unique sound that a Poké Ball makes when it lands is taken directly from the Pokémon anime, after which it was also added into further installments of each Pokémon game. Pikachu being released from a Poké Ball in its on-screen appearance. When thrown, it releases a random Pokémon upon landing. Each Pokémon has a different effect, such as attacking the summoner's opponents, changing the properties of the stage, and inducing status effects. The Pokémon available change between games, with every new release adding several Pokémon which tend to come from the most recent generations. Not every Pokémon returns in subsequent games, with some being replaced in function by newer Pokémon and some others disappearing completely. Since Super Smash Bros. Brawl, the Poké Ball makes a unique sound effect when it hits the floor (the Poké Ball bouncing sound from the Pokémon games and anime), thus alerting players to its presence even if it appears off-screen. Also, reflecting a thrown Poké Ball will change its ownership, and the Pokémon summoned from it will belong to the reflector rather than the thrower. In the first Super Smash Bros., up to 4 Poké Balls can be on-screen at the same time; this number was increased to 12 in Super Smash Bros. Melee. However, it was reduced to 3 in Brawl and Super Smash Bros. for Wii U. In Super Smash Bros. for Nintendo 3DS the limit is only 1, perhaps due to limited rendering power. Another version of the Poké Ball, the Master Ball, was introduced in Smash 4, which has the same function as the Poké Ball but only releases Legendary Pokémon, with a couple of exceptions. Non-item Poké Balls appear during the on-screen appearances of most playable Pokémon in every game except for Melee, and are thrown by the Pokémon Trainer for his Pokémon Change. Only Mewtwo and Lucario do not emerge from a Poké Ball during their on-screen appearances. In SSB4, damage varies based on distance. Projectiles thrown point-blank do more damage. Projectiles thrown or dropped vertically will do more damage at greater distance. However, in most cases, the Poké Ball either does fixed damage, or doesn't even hit. Pokémon in these tables are listed by their order in the National Pokédex. There are thirteen Poké Ball Pokémon in Super Smash Bros.. Unlike later games, all Poké Ball Pokémon are depicted as 2D sprites. There are twenty-nine Poké Ball Pokémon in Melee. Zapdos Rare ThunderShock Zapdos will begin to discharge electricity. Any opponent caught within this attack will be unable to move. 81% max. Entei Rare Fire Spin Entei produces a massive pillar of fire, trapping opponents within its vertical range. 72% max. Suicune Rare Blizzard Powerful gusts of snow swirl around Suicune, trapping opponents who are within its range. 36% max. Ditto was also planned, but cannot appear from a Poké Ball in the final game. It was originally intended to transform into its summoner and fight alongside them as a CPU player. However, it was removed due to technical difficulties with implementing its behavior. Ditto is still accessible through hacking, but it just cries "Metamon!" (its Japanese name) and then disappears. There are thirty Poké Ball Pokémon in Brawl. Pokémon with a given frequency of 0 are assigned a combined 1/493 chance of appearing, independent of the rest of the frequency system. It should also be noted that at the time that this game was made, there were only 493 Pokémon, probably resulting in the variable of the Pokémon appearing. There are forty Poké Ball Pokémon in Smash 4. There are fifty-five Poké Ball Pokémon in Ultimate. Certain Pokémon cannot be summoned on certain stages. Alolan Raichu Wild Charge Targets opponents as it flies around the stage dealing 8.0% per hit, often hitting opponents multiple times and damaging upon contact with Raichu. Duration of 11 seconds. Meowth Pay Day Meowth will hurl coins in a horizontal trajectory and will switch the direction it's oriented to face opponents. Abra Teleport Abra doesn’t cause any attacks that do damage, but it will approach the opponent and try to teleport them offstage. It will teleport them three times before disappearing. Electrode Explosion Electrode self-destructs after three seconds and is capable of damaging its summoner. During the last second, it can be picked up and thrown with good timing (with a smash throw having OHKO power). It will occasionally fail to detonate, making it available to be thrown as a projectile. Alolan Exeggutor Alolan Exeggutor does not attack; rather, it stands where it was thrown and its tall trunk/neck acts as a barrier, effectively splitting the stage in two. Fighters hoping to get around Exeggutor must go over its head or under whatever platform it is standing on. Goldeen Splash Goldeen flops on the ground, causing no damage in the process. Ditto Transform Ditto will transform into the character that threw the Pokè Ball and will fight alongside them. However, similar to certain Assist Trophies, Ditto can be damaged like a regular fighter. It was originally planned to be in Melee, but was scrapped due to technical difficulties. Eevee Take Down Eevee slams its body into opponents. Snorlax Body Slam Snorlax leaps off the screen and returns larger. It descends with the force of its full body weight. Moltres Fly Moltres will fly off the stage, but it will damage opponents it comes in contact with. Mew Fly Mew gracefully flies off the stage, dropping treasures as it goes. Togepi Metronome Togepi will randomly use one of five moves: Night Shade, Magnitude, Powder Snow, Hypnosis, or Leech Seed. Bellossom Sweet Scent Bellossom causes opponents within its range to fall into a deep sleep. Scizor Metal Claw Scizor will jump around the stage until it’s near an opponent, it will attack them by rapidingly slashing its claws. Returns after its absence from Brawl and Smash 4. Bewear Brutal Swing Bewear will move around the stage and let out a devastating uppercut to a nearby opponent. Pyukumuku Counter Pyukumuku will shoot out its hand as a counterattack, upon being attacked by the opponent. It can be thrown like a regular item by the character who summoned it. Tapu Koko Electroweb Tapu Koko will let out a large net of electricity to deal multiple hits to opponents. It also releases multiple electrical beams while attacking. These balls are used to capture and contain wild Pokémon. Most Pokémon must be weakened in some way before they can be captured, but once they're inside a Poké Ball, they enjoy their new home, since Poké Balls contain an environment specially designed for Pokémon comfort. Master Balls are the strongest type. An item used for capturing Pokémon and calling them out to battle. Pokémon live in these items which, despite appearances, actually contain a wide, comfortable, Pokémon-friendly world inside them. In Super Smash Bros., Pokémon give temporary support to whoever calls them out. You never know which Pokémon you'll get, but some of them are devastatingly powerful. The Poké Ball trophy appears in both versions of the game. In Super Smash Bros. for Wii U it is part of the Pokémon Gold & Pokémon Silver Trophy Box. An item used to call out different Pokémon. Which Pokémon emerges is a mystery, but it will aid whoever threw the Poké Ball. Some of the Pokémon contained inside are extremely powerful and will really intensify the battle. It's definitely worth beating your opponents to these! A ball holding one of any number of Pokémon just waiting to burst out and help you in battle. Which kind will it be? Well, that's a surprise, but whichever one it is, it'll definitely up the intensity of the battle! If you see one, make sure you're the one to grab it! Icon from Super Smash Bros. The Poké Ball from Melee. The Poké Ball from Brawl. Luigi with a Poké Ball, and Mario with a Master Ball. The Poké Ball from Super Smash Bros. for Wii U. The Poké Ball from Super Smash Bros. for Nintendo 3DS, which releases a Pokémon at random. A Pokémon, in this case Suicune, being released from a Poké Ball. Pikachu's victory pose in Ultimate with a Poké Ball as the series symbol. Artwork of a Poké Ball in Ultimate. King Dedede with a Poké Ball on his hammer in Ultimate. The Poké Ball from Ultimate, which has been opened up. Charizard is the first (and so far only) Poké Ball Pokémon in the series to become a playable character in later installments. The chance of encountering Mythical Pokémon in the games of the series has varied depending on the number of Pokémon available in the main Pokémon series upon the Smash game's release. Mew has a 1 in 151 chance of appearing in Super Smash Bros., referencing the number of Pokémon available in Generation I.
Mew and Celebi each have a 1 in 251 chance of appearing in Melee, referencing the number of Pokémon available in Generation II. Mew, Celebi, and Jirachi each have a 1 in 493 chance of appearing in Brawl, referencing the number of Pokémon available in Generation IV. Mew has a 1 out of 720 chance of appearing in Smash 4, one less than the number of Pokémon available in Generation VI, as Volcanion was not revealed until long after the game's release. Mew has a 1 in 809 chance of appearing in Ultimate, referencing the number of Pokémon available in Generation VII. In Melee's Training Mode legendary Pokémon do not appear, and a few Poké Balls may not release any Pokémon at all, possibly to prevent the player from grinding for Mew and Celebi. Mew, Goldeen, Snorlax, Moltres, Electrode and Charizard are the only six Poké Ball Pokémon to appear in all five Super Smash Bros. games. Charizard, Electrode, and Moltres appear in some capacity in every game, with Charizard being playable since Brawl and Moltres and Electrode occasionally appearing in the background of Saffron City. Only Mew, Goldeen, and Snorlax remained as Poké Ball Pokémon in all appearances. In Super Smash Bros. Melee, all Poké Ball Pokémon models are reused from Pokémon Stadium and Pokémon Stadium 2. In Super Smash Bros. Brawl, all Poké Ball Pokémon models are reused from Pokémon Colosseum, Pokémon XD: Gale of Darkness, and Pokémon Battle Revolution. Super Smash Bros. 4 is the first Smash game to use original Poké Ball Pokémon models. Every Generation IV Poké Ball Pokémon introduced in Brawl had its Poké Ball role removed in Smash 4, with only Piplup and Manaphy being changed into background characters on Kalos Pokémon League. The Staryu and Koffing evolution lines are the only Poké Ball Pokémon to replace another member of their evolution line in later installments. Vulpix is the first Poké Ball Pokémon to appear alongside an alternative version of itself, being its Alolan Form. Likewise, Raichu, Vulpix, and Exeggutor are the only Pokémon who appear in their Alolan forms. Totodile, Tepig, and Froakie are the only members of their region's starters that haven't appeared as Poké Ball Pokémon. Likewise, Torchic and Piplup are the only members of their region's starters that have appeared as Poké Ball Pokémon. Alola is the only region in which none of its starter Pokémon appear as Poké Ball Pokémon. Kanto is the only region to have all three of its starter Pokémon appear as Poké Ball Pokémon. Likewise, it is the only region to have starter Pokémon appear in their fully evolved forms rather than their first-stage forms, with all three being fully evolved. Out of the 23 Poké Ball Pokémon that have a signature move, only 11 of them use it when summoned. A summonable Fire-type Pokémon that does not use a move with the flame effect. A summonable Grass-type Pokémon that uses a move with no elemental effects. At least two summonable Dark-type Pokémon. A summonable Pokémon that can use two moves in the same game. Although no two of the same Pokémon can appear in a battle at the same time, this is possible in Training Mode. Many of the Pokémon use moves that they cannot normally use in the games. For example, Goldeen cannot learn Splash in the Pokémon games. All Pokémon from Smash 4 return in Ultimate. Meowth and Scizor are the only Poké Ball Pokémon to be cut and return in a later installment. All new Pokémon in Ultimate are solely either Generation I or Generation VII Pokémon. All Pokémon say their names like in the anime, with the exception of Porygon2, which uses its cry from the games. Neither of Porygon's evolutions have made an appearance in the anime due to the infamous episode, EP038. Some Poké Ball Pokémon cannot appear in a Pokémon-related stage that features said Pokémon in the background in Ultimate: for example, Electrode cannot be summoned in Saffron City, Scizor cannot be summoned in Kalos Pokémon League, and Palkia cannot be summoned in Spear Pillar. ↑ 1.0 1.1 1.2 Became a fighter. ↑ Only available via Action Replay, and doesn't use Transform. This page was last edited on April 16, 2019, at 16:22.